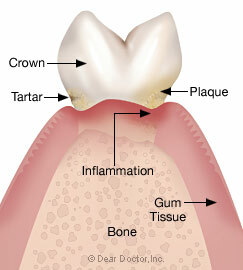 Stage 1: Gingivitis — inflammation of the gingiva (gums) without bone loss. Stage 2: Early Periodontitis — inflammation of the gingiva (gums) and the surrounding tissues that results in early bone loss. Stage 3: Moderate Periodontitis — inflammation of the gingiva (gums) and the surrounding tissues that results in moderate bone loss. Stage 4: Advanced Periodontitis — inflammation of the gingiva (gums) and the surrounding tissues that results in severe bone loss. One of the most famous clinical studies was carried out in 1965 by Professor Harold Lðe in Denmark. Dental students with healthy periodontal tissues were instructed to stop all oral hygiene and were regularly observed for a three-week period. 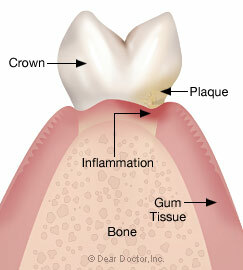 Over time all the students developed gingivitis, or inflammation of the gums. At the same time the bacterial makeup of dental plaque changed and became more complex. The bacterial population and the students' periodontal health returned to normal soon after oral hygiene was re-instituted. This landmark experiment clearly showed what has become an axiom in modern periodontics, that there is a direct relationship between oral (mouth) bacteria concentrated in dental plaque and periodontal disease. The biofilm we currently refer to as dental plaque is similar to other types of biofilms: colonies of living organisms that are generally specific to a particular eco-system (the interaction of organisms within a specific environment). Your mouth is one of these eco-systems with conditions conducive to growing bacteria that promote both health and disease under the right circumstances. Disease-causing bacteria tend to appear in oral biofilms not disturbed on a regular basis by oral hygiene procedures like brushing and flossing. As gum disease sets in, the disease-causing bacteria move into defects known as periodontal pockets around the teeth from which they are increasingly difficult to remove. There are currently over six hundred species of bacteria known to exist in the mouth alone, with only about four hundred currently identified. Disease-causing bacteria may only account for a small proportion of the total bacterial population in the mouth, but their effects if uncontrolled can be devastating. If that growth remains unresponsive to conventional cleaning techniques, it may be necessary in some cases to identify them so that they can be treated with specific antibiotics. Periodontal disease, or gum disease as it is commonly called, is really a group of diseases with the same end results; inflammation of the gums (gingivitis), destruction of the periodontal ligament, loss of supporting bone and ultimately tooth loss. Nearly all people will develop gingivitis in the absence of good oral hygiene; however, only about 10-15% of people go on to develop more advanced periodontal disease with the loss of supporting bone and eventual tooth loss. Of the people who go on to develop advanced forms of periodontal disease, 70% develop a chronic form of the disease that becomes worse as the patient ages. 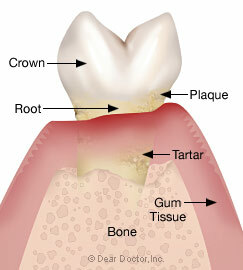 It has a pattern of attachment (bone) loss that is the same on both sides of the mouth and is predictably treatable. 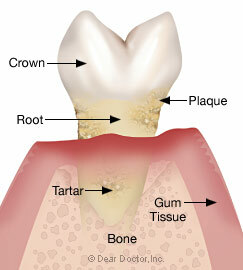 The other 30% of periodontal disease patients develop different forms and patterns of disease. Some are more and some less rapidly progressive, affecting younger age groups and are associated with different combinations of disease-causing bacteria and/or deficiencies in their immune system. If left untreated, attachment (bone) loss tends to progress in spurts of activity rather than in a steady progression. It is more cyclical than linear, short periods of rapid disease progression are followed by longer periods of attempted recovery by the body and then once again by further breakdown.